What is Tomatina for children? Tomatina for children is the youngest variant of this tradition. This initiative was born in 2013, and it is a scaled-down version of the popular party adapted for kids. The rules are the same as in the Tomatina and this Tomatina for Children is as a prelude to the great battle what’s to come on the last Wednesday of August in Buñol: La Tomatina. 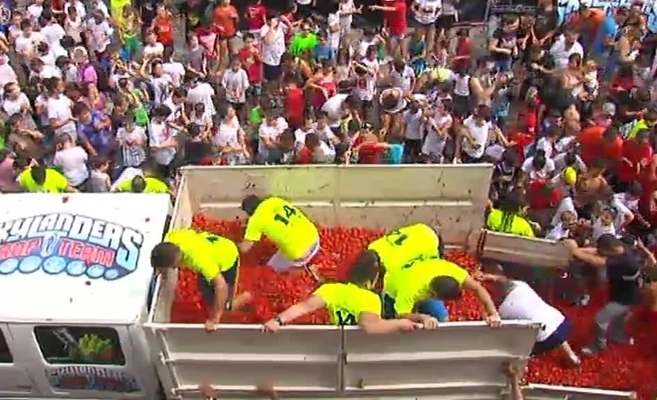 This “Mini Tomatina” ensures the continuity of one of the best-known parties in Spain and one of the most international festival. It is also the opportunity for children to participate actively in this party in a much safer and more controlled way. When is Tomatina for children celebrated? La Tomatina for children is the Saturday before original Tomatina. In other words, if La Tomatina is on August 28, Tomatina for children will be celebrated on the 24th. 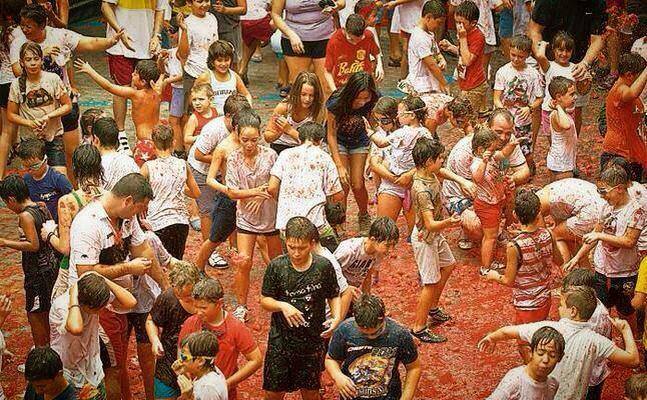 This children’s Tomatina edition starts at 12:00 am and last for half an hour over half an hour. It is celebrated in the town square (Plaza de Buñol) and is specially designed for children from 4 to 12 years old. So adults should settle for watching the party from the fences and take photos. Access to the Tomatina for Children is free and has a capacity of 2500 children. What should be taken into account in Tomatina for children? Remember that the rules are the same as for the original Tomatina. Only children from 4 to 14 years old can participate and enter within the enclosure. Tomatoes cannot be thrown outside the stipulated hours. In addition, you must crush them a bit before throwing them avoid hurting other participants. Violent behaviours are not allowed. Use of diving or swimming goggles closed sneakers (do not use flip-flops) and old clothes are recommended. Remember to bring extra clothes for the kids. And the most important: have a good time and throw all the tomatoes you can!